Wallace (Wally) Burrows was born in Cardiff in 1922, although his family were from Gloucester, his father had been a groundsman at the Cardiff Arms Park and for a period the family had moved to the Principality. 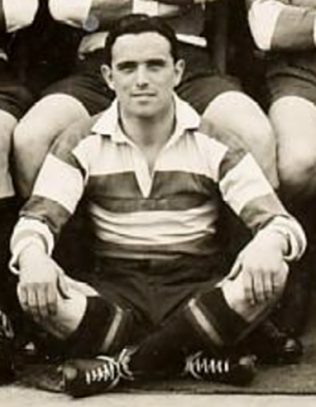 Wallace grew up in Gloucester and played rugby for Gloucester All Blues but in the 1940-41 war time season he played nine games for the Gloucester Football Club at scrum half before joining the RAF on 18 February 1941. His RAF duties soon him away from Gloucester and after a period of training at a variety of establishments throughout England and South Africa, he was transferred to 101 Maintenance Unit (101MU) at Helwan in Cairo, Egypt as Ground Crew supporting RAF missions across North Africa. On 15 August 1945, after the end of the war in Europe, Corporal Burrows was transferred to RAF St Athan which enabled him to travel to Gloucester and play for the Gloucester Football Club. He was demobilised on 27 September 1946 and moved permanently back to Gloucester where returned to his pre-war place of work as an Apprentice Compositor at Gloucestershire Newspapers Limited. Between 1945 and 1952 he played seventy-nine times for the First XV, scoring ten tries and three drop-goals. His achievements were recognised by the Gloucester Football Club with the inclusion of his name on the Honours Boards for the 1948-49 and 1949-50 seasons. He won three Gloucestershire County Caps against Somerset (1948), Middlesex (1949) and Lancashire (1949). After his rugby career Wallace built up a successful garage business in Hucclecote. He died in Gloucester in 2000 aged 78 years.